This place is as good as it gets when it comes to planning the most wonderful day of your life. From the moment I took the tour with my fiancé I knew this was where we'd get married! I could not have planned a more perfect and joyous day, nor could I have been more pleased with the process and outcome. From the day we signed the contract, the entire staff had been so attentive, from their prompt email responses, to returning our phone calls ASAP...it totally made our planning process as easy as it could be! Now to our actual wedding day (June 24, 2017) Courtney was amazing, she made sure everything was ready and absolutely perfect. Ashlee was the absolute best, if I needed ANYTHING she was always right there making sure it was taken care of, completely easing my nerves throughout the day....and now for the party!!! "Bobby" (Robert?) the bartender was just an all-star, and totally made sure everyone's thirst was quenched! The entire staff was super attentive, professional, and went above and beyond our expectations!! Thank you so much for making our special day so perfect!!! Thank you so much for everything you and the team did for our wedding. It was our dream wedding and everything was perfect. I know not many people can say that but I am so happy I can. I had not one worry during our wedding and it's because of you and your team. Thank you from the bottom of our hearts for such a magical day! "Where to event begin.... Before the day of me wedding I was so stressed!! That morning however you walk into the cottage amore (highly recommencement renting this) and you start to feel relaxed. Your coordinator meets you and reassured you that everything is truly taken care of. They were amazing throughout the whole experience and I can now say that it was the best day of my life. It was beautiful, stress free, and a blast!!! Thank you Courtney and Ashlee for making me feel so special. You are both amazing." "I don't know where to start. My wedding day at Serendipity was better then I could have ever dreamed. The ladies at the Serendipity office made the planning easy. The documents they sent were really helpful and informative. I took advantage of pretty much all their extras. I used Cottage Amore to spend the morning in getting ready and I am so glad I did. It was such a piece of mind being there early and relaxing and knowing that I was there and they everything was going to run smoothly. The day of the wedding I trusted that everyone was where they were suppose to be and doing what they were suppose to do. Everything was great and beautiful. Ashlee and Courtney where amazing on the day and such big helps. Anything I asked was done without hesitation. Ashlee even carried around my lipstick for me and reapplied it multiple times during photos. Courtney help my mom when I had a snag in my dress. I had a few freak outs before hand and the staff was great at calming me down and reassuring me that everything was going to turn out great. The venue itself is stunning. The flowers, the pond, the barn, the ceremony and reception area are all spectacular. I couldn't have asked for a more perfect location to celebrate my marriage. The DJ was great at fulfilling all our wishes during the ceremony and reception. Our guests had a blast. I have received so many compliments about the day of our wedding. We also got the photo booth and my husband and I received the link to view all our guests photos while on our honeymoon and we got a great laugh going through all the photos from the booth. Thank you to everyone at Serendipity for making our day everything we wanted and so much more." "My husband and I recently had our wedding at Serendipity Gardens on November 5, 2016. It was far more amazing than I could have ever imagined for our wedding day. Living in Las Vegas and planning a wedding in California seemed like it was going to be difficult but with the help of Ruth, Courtney and Ashley, the planning process was so easy, I felt like it was too good to be true. The quality of vendors that is provided with the package that you book is unreal. We received so many compliments on our venue, food, cake, DJ, flowers, etc. My husband and I couldn't stop talking about the wedding for a few days after because we couldn't believe how perfect it was and it was by far the most amazing day of our lives! I would highly recommend Serendipity Gardens to anyone looking for the perfect wedding experience!" "My husband and I were married at Serendipity. Everything exceeded our expectations by far. The staff, and the wonderful service they provided were a pleasure to work with. Our coordinator Ashley was so sweet and professional. Courtney, who took us on our initial tour of the venue was great, and was always available to help. The venue is so gorgeous! 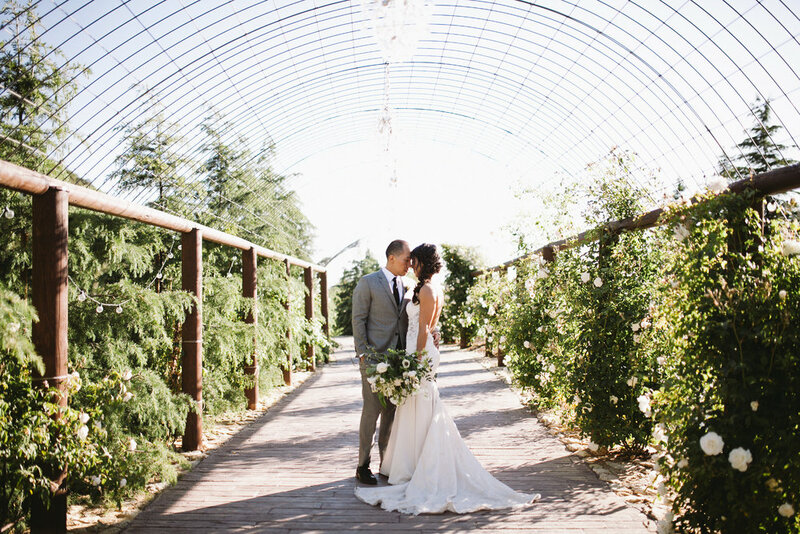 Nestled in between the mountains of Oak Glen, the beautiful greenery and rose bushes throughout, were a beautiful backdrop for our photos. I felt like a princess as I was taken down to the ceremony by horse and carriage! All of our guests were so impressed with the venue, and everyone had a great time! Thank you Serendipity Team for our beautiful wedding day experience!" "My husband and I were married here on June 28, 2014 and all I can say is it was amazing! Main points: clean grounds, attentive staff, great food, awesome DJ, wonderful vendors. When my bridesmaids and I first arrived, our bridal assistant and manager were with us or checking in on us every five minutes to make sure we had drinks and were cool enough. The bride's room is absolutely beautiful and big enough that it held myself, mom, mother-in-law, two grandmothers, photographer, and five bridesmaids! Wow! The owner, Tamara, did a wonderful job decorating it and the decor and colors are very calming. The bridal assistant did a fantastic job organizing our ceremony getting the bridal party down into the ceremony area on time. We would have started exactly on time, but I requested we start a tad late since many guests all pulled up right as I was getting into the carriage. She was so attentive to not only me, but also my parents and bridal party during pictures. She was always next to me grabbing my bouquet or holding my dress up or getting me water. This was definitely a blessing as it made me less stressed! The new barn area is beautiful and adds a whole new element of beauty to the grounds! It was a cool, breezy area to take pictures! After our pictures were completed, the DJ took over and did our grand introductions. He is AWESOME! He kept everything running very smoothly and played exactly what we asked. My husband and I were pretty strict with what we told him we wanted played and when our guests asked him to play certain things, he didn't waiver which we loved. He played such great dance music that the dance floor was packed and our guests are still talking about how awesome the atmosphere was. The food was delicious and hot and I appreciated our parents being served in addition to us. The servers were timely getting dirty dishes taken away from people and made sure the drink station and coffee station was refilled. Even during the reception, the staff were very attentive to my husband and I, but more importantly, our parents. They made sure they had drinks the whole time and any time a guest handed our parents something, one of the girls was there to take it from them and put it away. They did a great job organizing our sparkler sendoff and from what my parents said, were a big help during clean-up. Two major vendors that were not present at the wedding, but truly made it were Michelle's and Flowers, Etc. Michelle's cake was delicious and the design was just what we asked for. I cannot say enough about how amazing our flowers looked. Majed, Robert, Allison, and the rest of the team worked so hard getting our large order of flowers just right and I don't know what they did to them, but they survived the heat! They looked beautiful even three days later! Tamara and Phil Kerbs have done a beautiful job with their venue despite the amount of weddings they now book! It's a good feeling to know that you won't see any trace of the wedding the day before and that the staff is refreshed each and every time! I truly could not have asked for a more perfect wedding! "Courtney & Tamara, I hope this note finds you well. Where do I begin?...You ladies made June 20,2015 a day, I ( as well as Larry and our family) will never forget!! Thank for your amazing level of professionalism, patience and attention to details throughout the planning process and on the day of my wedding. With all of the nervous and exhilaration in the air, the cottage was the perfect space for me to spend time the ladies closest to me and truly enjoy each moment leading up to the ceremony. (BTW: My Stylist misses "her" beauty cottage!. Now, she demands a beauty cottage for all of her gigs! LOL) I'm so glad you built the barn. It was the perfect shelter and backdrop for our first look and family photos. I had no idea how majestic the horse and carriage would be. And to think, I was seriously considering walking down the hill with my Dad! The ride down the hill with my Dad was surreal. It gave us a little private moment to check in and embrace what was about to take place. We knew the ceremony site was a breathtaking but having the our family and friends framed by the natural landscape and pergola was picturesque. From the ceremony to the reception, I'm so grateful to have had you ladies as the eyes, sound minds and helping hands throughout it all. We[Larry and I] had an amazing time! Your DJ rocked the party! PLEASE, please tell the Chef "Bravo!". He/She did an outstanding job incorporating the rubs and marinades into our meal. The food was exceptional! Earlier this year, as we were planning, we knew June 20th would be special. After my sister's passing, June 20th gave my family something joyful to look forward to. Having spent months grieving, everyone(myself included) was ready for a celebration and the entire Serendipity Garden staff made that wish come true. Although, I've written a novel of an email, there are no words to describe my gratitude for all you have done. Truly the whole journey, from search to sparkler exit was Serendipitous. Thank You". 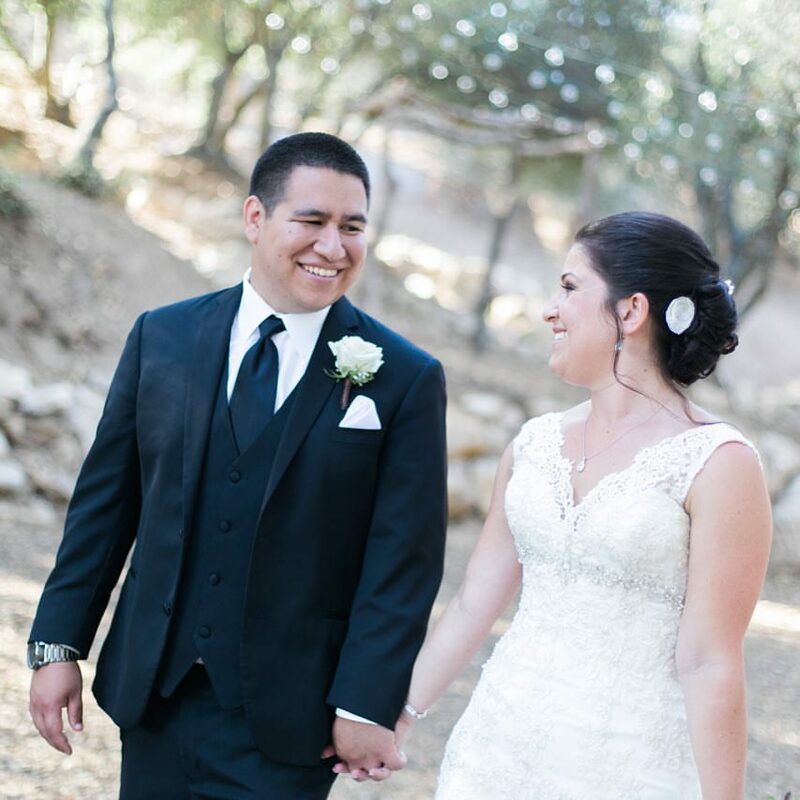 “I just wanted to say how happy we were to have our special day at your venue. Our coordinator was amazing. She went above and beyond for us! The DJ is great. He has such a cool, laid back personality. He is professional and fun all at the same time. We were really impressed with all of the vendors, the cake was delicious, the food was great and the flowers were gorgeous. Tamara, you have an excellent business and we are so fortunate to have found you. Thank you and your staff for all that you did. We had the best time." Reach out to our Team! We can't wait to hear from you!